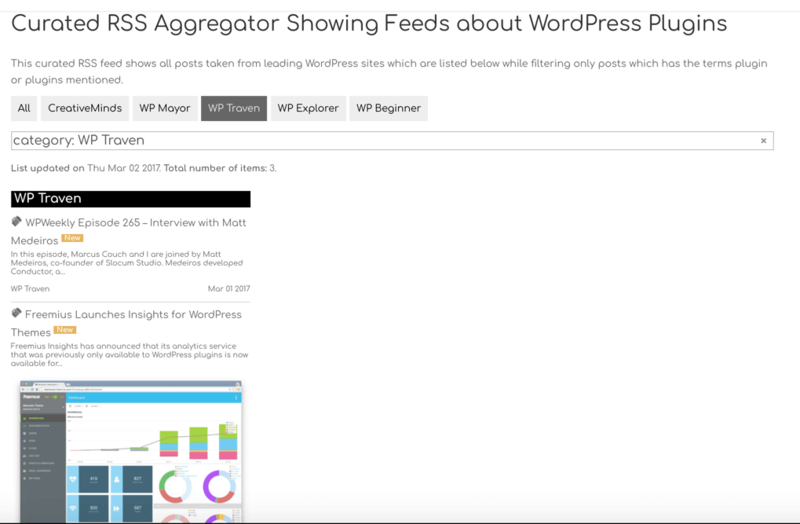 The CM RSS Aggregator plugin is a powerful tool for RSS importing, merging, and displaying curated RSS and Atom feeds on your WordPress site. It lets you aggregate multiple RSS feeds into one list and filter imported content by keyword. 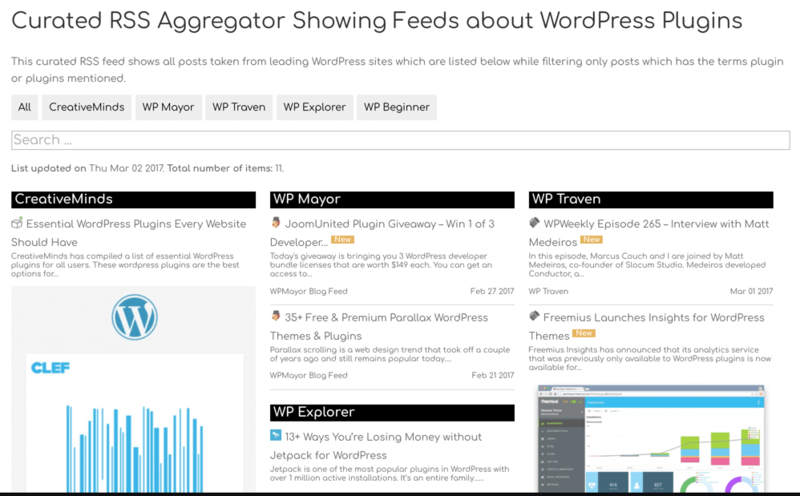 Get RSS Aggregator Pro and 6 other essential WordPress publishing plugins for 50% less! 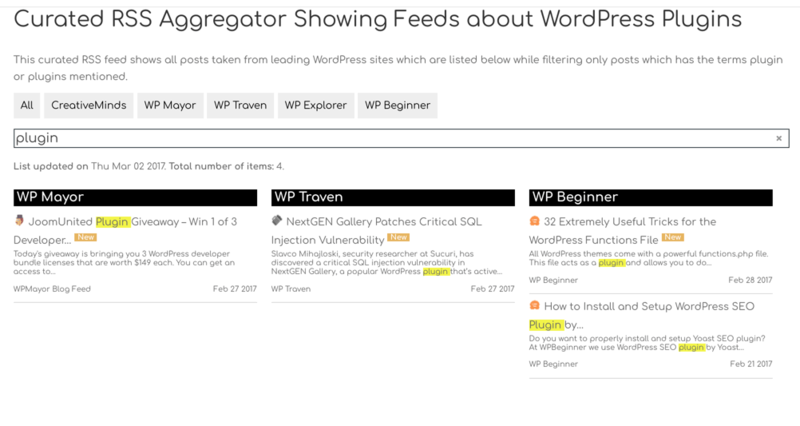 The WordPress RSS Aggregator Plugin lets you aggregate multiple RSS feeds to create a curated list of feed contents. Arrange feed content by category or topic to display multiple RSS feeds in an easy to use list style. Each curated RSS feed list can be shown using shortcode on any page or post. The user can filter information with a live search filter as well as by categories or tags. A sidebar widget can also be used to display a single category showing multiple curated RSS feeds. @radicarl at WordPress.org: "Simply the best plugin in its category - I tested a dozen plugins to import RSS feeds on my new Web project. Not only the core of this plugin is powerful, but it is very complete in terms of the option. But the best is the excellent customer service..."
This is an ideal content marketing tool by allowing you to maintain a list of your favorite RSS feeds, recommend curated feed content to your users, and arrange knowledge bases around related content by category and subcategory. This is a amazing tool for building repository of professional resources for industry news while linking directly to original news sources. Aggregated Curated RSS Feeds – Build one or more curated lists of WP RSS aggregated news sources or feeds. 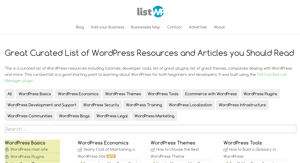 You can then display different lists on any page of your WordPress website. Knowledge Base of RSS Syndicated Content – Create a knowledge base of the most recent updates in your field. Import RSS Content – Import RSS feed based content from one WordPress site to another. Filter Imported Content by Keyword – Filter imported feeds based on keywords (blacklist or whitelist), so you only aggregate the items you want. RSS Content Attributes and Image – Display RSS excerpts and thumbnails together with the title, date and source in your feed item display. 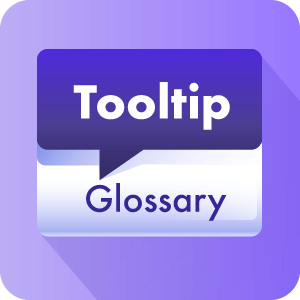 Tooltip Support – Show tooltips including full content excerpts when hovering over an item. 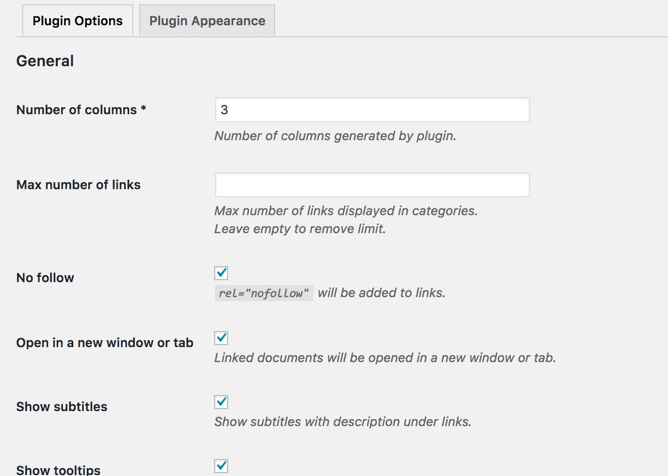 Sidebar Widget – Add a widget to any section of your WordPress site to display your imported feed items. 1. Start by defining the RSS import list name. 2. Define all related feed categories you are going to use for the RSS import. 3. In each category define the feed URL and the feed refresh interval. 4. Add keywords (positive or negative) for each feed so that RSS import will only aggregate content matching specific keywords. 5. 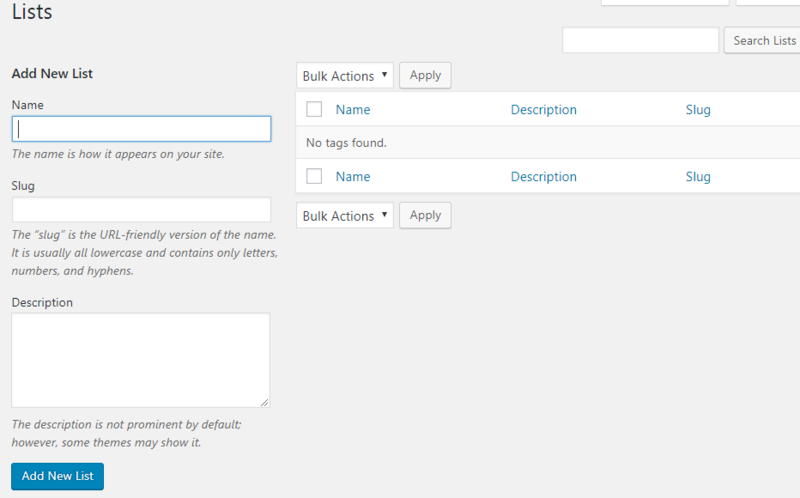 Add tags by defining keywords to display a tag near each feed item based on its content. 6. Place the list shortcode on any page or post using shortcode. 7. Choose to display a single category of curated aggregate RSS feed content in a sidebar widget. 8. 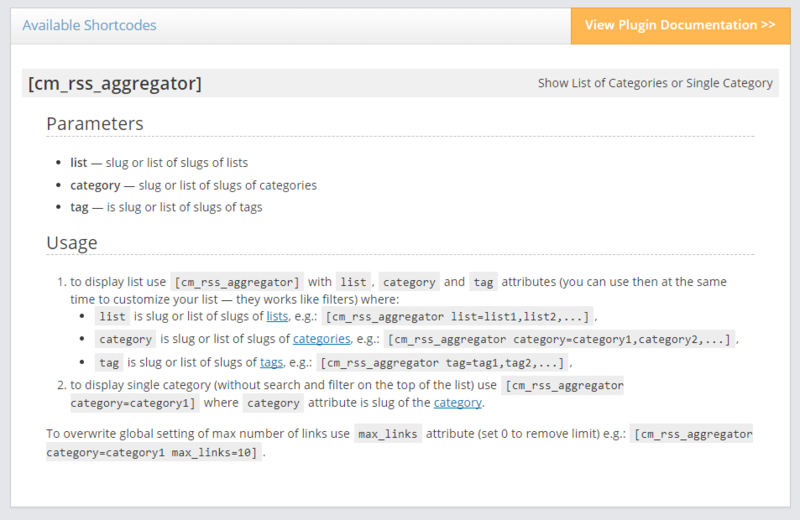 Once your curated RSS list is displayed, users may filter feed content by tag, category or free text filtering. 9. A favicon is automatically shown near each link in the list. 10. A NEW tag is shown for items which are not older than the defined amount of days as set in the plugin settings. What is the Difference Between the WP RSS Post Importer and the WP RSS Aggregator Plugins? ​​The CM WP RSS Aggregator plugin can read RSS feeds from external sites, but will only keep the title and initial description of the external post while linking to the external URL of the original source for the full post content. Once a user clicks on the title, they will be redirected to the original post. 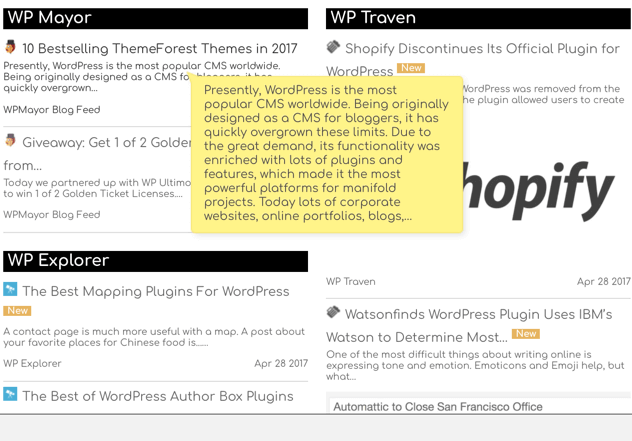 ​The CM WP RSS Post Importer plugin imports the actual post content to your site while letting you define the exact template of the content. This gives you complete control over content syndication, while pulling feed content from a wide range of sources. 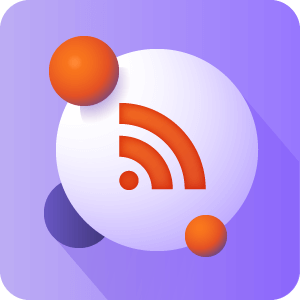 Create a list with any number of RSS Aggregator feeds. Use shortcode to display RSS items on any page or post as a feed to post. Create Multiple Lists – Users can create multiple lists of aggregated RSS feeds from different feed sources and display RSS items as a feed to post anywhere on their site using shortcode. Display Different Lists – It’s possible to display different lists or combination of lists on any page, by using simple shortcodes. 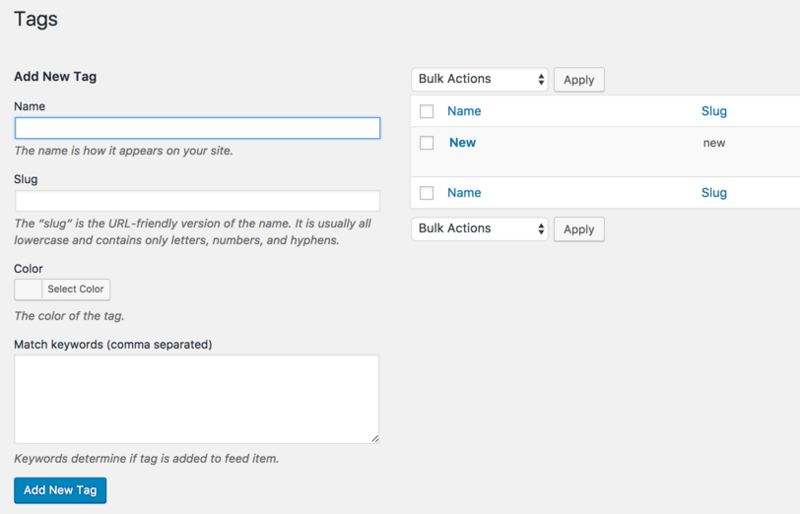 Filtering Options – Add whitelisted or blacklisted keywords for each feed source. Keywords will be matched against RSS feed content and only items which match the positive keywords or do not contain negative keywords will be imported. Update Interval – Define the update interval for each RSS feed source. 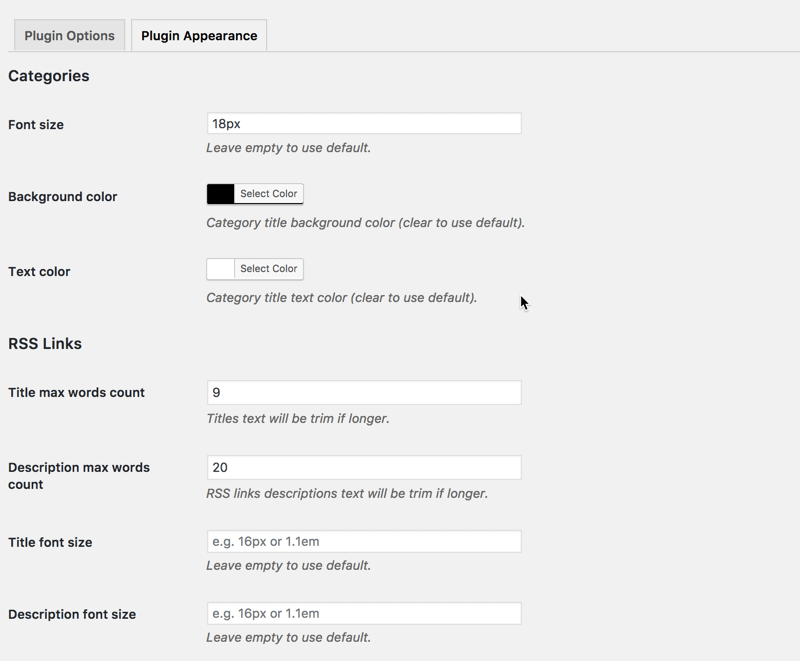 The plugin will refresh the feed content based on the interval parameters. Tags Support – Tags are associated with RSS feed items, as defined by keywords found in the RSS item content. 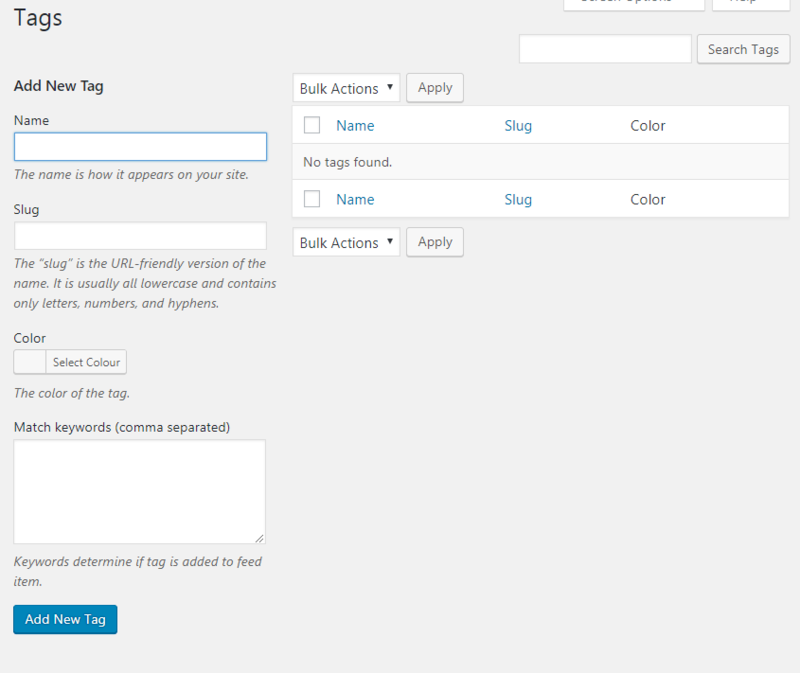 Users can filter list items by tags and customize the colors for each tag. 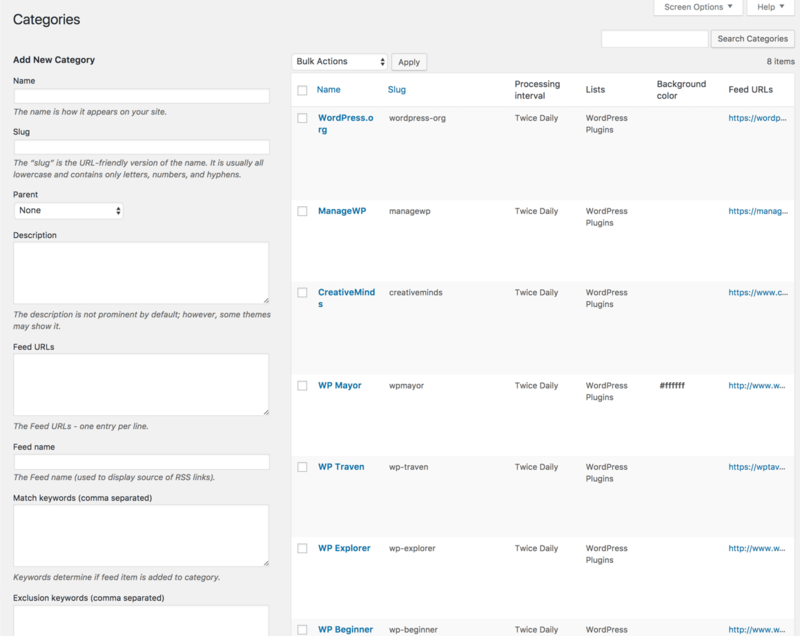 Fast Filtering Support – Users can filter list items by text, category or tag. All relevant items will be displayed upon filtering. Category Background Color – Users can choose to set a background color for each category feed item. 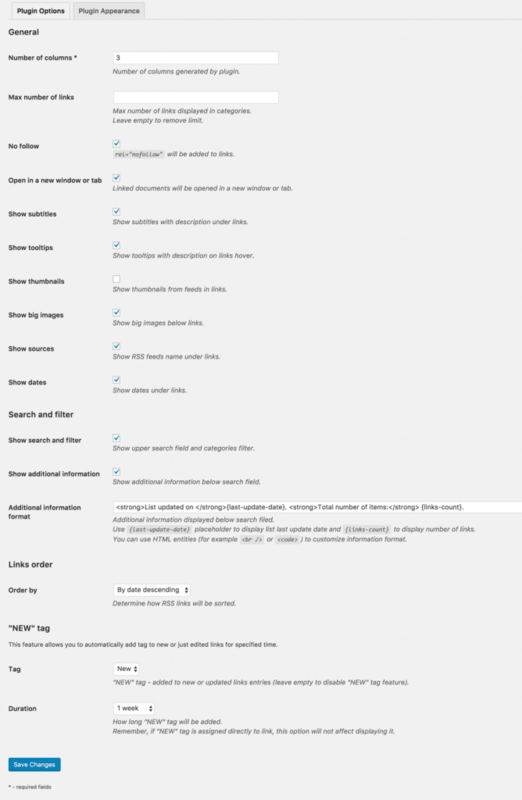 Styling Options– Users can define several options for the look and feel of the list such as tooltip color, background color, font size and more. Last Update – Each list will display the last date content was updated. User Personalization – Each user can personalize the RSS feed display by unchecking the categories they do not want to view in a specific list. Number of List Items – For each list, the number of items included in it will be displayed. Remove Items from RSS Feed – Manually remove items from the feed to manually curate the list of items in the feed. Subtitle Content Extractor – Support reading the content of the RSS link subtitle (appears below the link title) from any existing RSS fields. 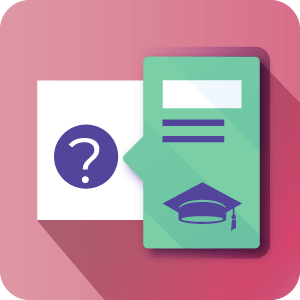 Users can define the field of what information to extract for each category. For example the price of an item. 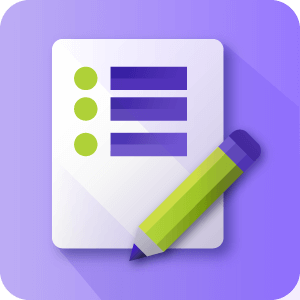 RSS List Ordering Options – Order categories within each list using a drag and drop interface. Order Feed Items Per Category – Define how feed items are ordered in each category. 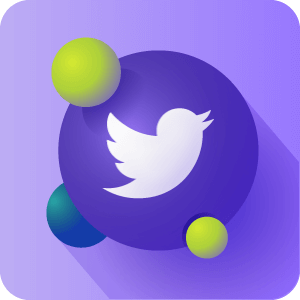 Source Permalink – Link directly to the original source for each feed item. Image and Favicon – Each item will show a favicon from the source it is taken from and an image in case it is found in the content of the imported RSS content. 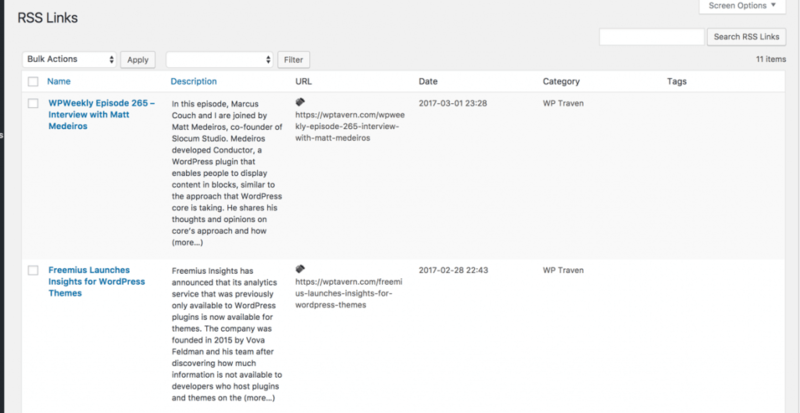 Mark New Items – You can define in the plugin setting which items in the RSS feed will be automatically marked with a specific tag such as “New”. The tag is time based so after a defined amount of time the tag will be automatically removed. RSS Import Widget and Feed to Post shortcode – A widget can be used to display all the feed items for a specific category, while a shortcode to be placed on any post or page to easily display feed to post content. Wide Format Images – Featured images found in the RSS feed can be displayed in a wide format to create a better fit visual content. Can I choose the arrangement of the categories in each list? Yes. 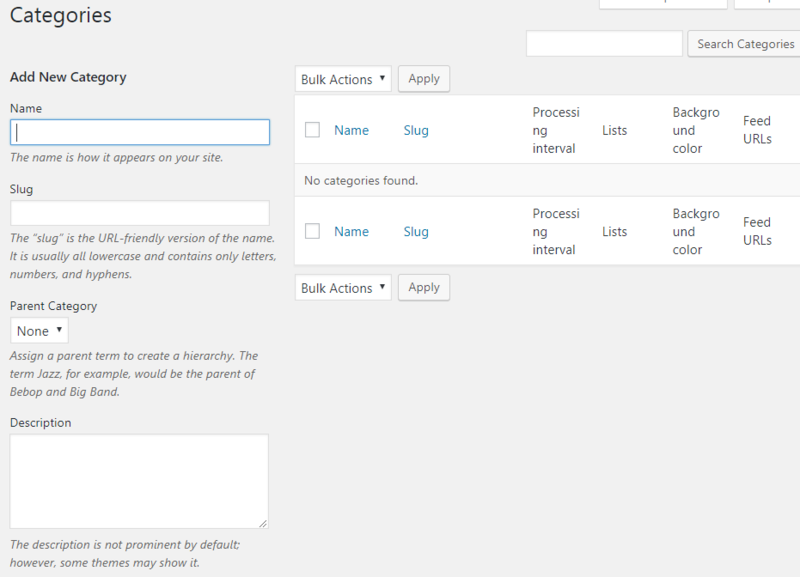 You can manually order the categories appearing in each list with a drag and drop interface in the Plugin settings in the WordPress admin panel. To learn more about how to organize categories with the Curated RSS Aggregator see this documentation article. Can I use the same category in more than one list? No. You can use multiple sources in each list and also in each category. This supports creating a multiple RSS feed list showing aggregated content over a specific topic. Is there a shortcode for use on specific pages or posts? Yes. You can embed a category view on any post or page using a shortcode. 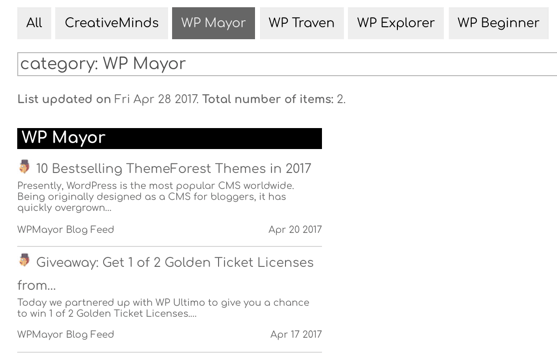 You can also find a widget which will show a specific category on your WordPress site sidebar. Can I show different feeds on different parts of the website? Yes. You can use different shortcodes to display whichever lists of feeds you want on any page. Check the shortcode documentation to learn more. 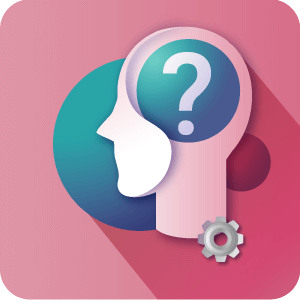 Do users choose the categories and subcategories? Yes. User can define the categories to which each rss source is aggregating the content. You can name the directory according to the source or topic involved. Does the plugin import the content over to my site? No. The aggregator only creates a snippet of the original content while still pointing to the original content on the source site. The RSS Importer fetch the RSS feed into a local post while allowing you to control the content and modify it. The Aggregator only creates a snippet of the title and short description while still pointing to the original content. 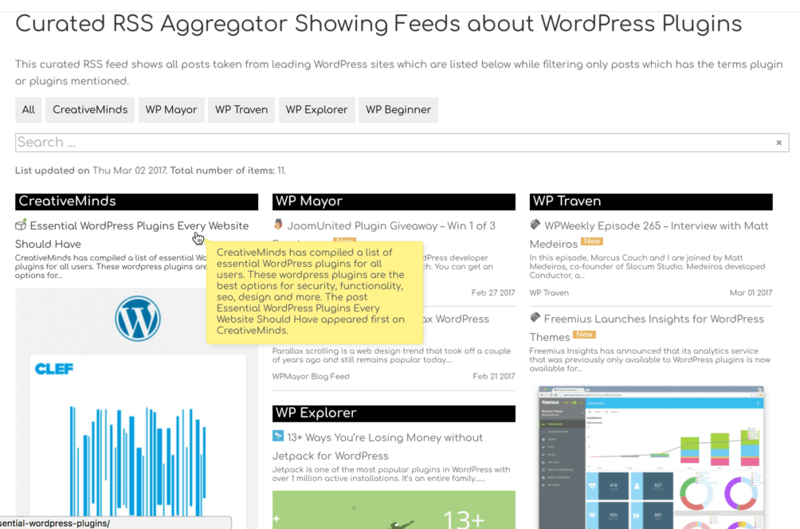 View a curated list of WordPress news resources generated with the RSS Aggregator plugin. I tested a dozen plugins to import RSS feeds on my new Web project. Not only the core of this plugin is powerful, but it is very complete in terms of option. But the best is the excellent customer service … can even push for the development of the plugin according to our needs. Thanks again to the nice employee Marcin who unlocked my project. Added the option to change the color of the RSS link title and description.